In today’s highly competitive sales environment, where success depends on meeting the specific needs of buyers, an accurate and timely sales forecast is a critical tool for optimizing business outcomes. I discussed this as part of our 2014 research agenda for sales, noting that linking the forecast to commissions, quotas and territories is a requirement for success. We recently completed new benchmark research on sales forecasting to ascertain the state of the processes and technology sales organizations use. This research continues to find less than adequate efforts by organizations to improve their sales forecasting process and insufficient information about the full revenue potential from accounts and customers. Each of our benchmark research studies generates a Performance Index that assesses organizations’ performance in a specific process and how well people use information and technology. Our latest sales forecasting research places fewer than one in five (18%) organizations at the highest Innovative level of the four by which we measure sales forecast performance and increasingly larger percentages at each of the succeeding lower levels; more than one-third (35%) rank at the lowest Tactical level. The largest organizations by both number of employees and annual revenue perform better than smaller ones. We find that organizations do see the importance of sales forecasting: More than half (55%) said that it is very important, and another one-third (34%) said it is important. But execution is another matter: More than half (53%) are not satisfied with their current sales forecasting process, and two-thirds (64%) of those that said forecasting is very important also said they are not satisfied with the process. Why are people most dissatisfied? 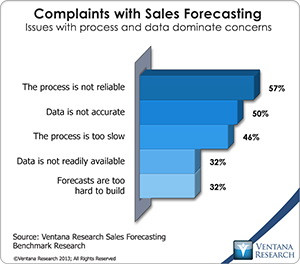 The most common complaints about how sales forecasting works are that the process is not reliable (for 57%), data is not accurate (50%) and the process is too slow (50%). But those seeking to address these complaints encounter barriers that obstruct improvement; those most commonly cited by organizations not satisfied with the current process of creating forecasts are lack of resources (84%), no executive support (79%), no suitable software (77%) and lack of awareness (75%). All of these findings indicate room for improvement across the people, process, information and technology dimensions of performance. Dissatisfaction correlates with low confidence in the sales forecast and the information in it; 44 percent lack confidence, which is even more disturbing when we remember that the information from the forecast is essential for managing not just the process but all of sales operations. Similarly issues with accuracy of information also correspond to lower levels of confidence: Fewer than one-third (29%) of participants said that their forecasts are more than 80 percent accurate; that is a lower number than in our previous research. One way to improve accuracy is to tie performance rewards to it, but we find that not many (29%) organizations reward sales forecast accuracy. However, those that do this are more confident by a large margin in the quality of the information than those that don’t (61% vs. 37%). 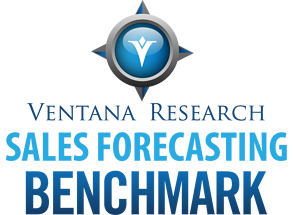 Thus we recommend the use of rewards as a way to improve the accuracy of sales forecasts. A related element is timeliness, and the research finds that often the sales forecast takes too long to generate: One-third (35%) of organizations take three weeks or longer to generate a sales forecast, more than one-fourth (27%) take a week or two, and the fewest (24%) take less than a week. The time spent to process a forecast can impact the frequency of sales forecasting and hence its usefulness. This sluggishness often is related to inadequate technology to process and generate information for review and metrics to guide improvement. 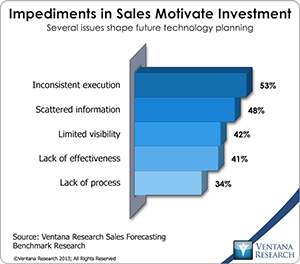 Almost half (44%) of sales organizations acknowledged that they have impediments that motivate management to contemplate further investment in sales technology. Speaking of technology, only two in five (40%) of the organizations participating in this research use dedicated tools for sales forecasting. Most that do are new to the technology; three in 10 have been using it for more than a year, and 10 percent more began in the last year. Those that use dedicated sales forecasting technology told us it is helpful: More than one-fifth (22%) said it has improved significantly the outcomes of sales activities and processes, and half (51%) indicated it has improved them slightly. The largest organizations have been using dedicated software longest among company sizes. Less than one-fifth of participants said they have no plans to deploy dedicated software. Asked why, most (58%) said they do not know, which indicates a lack of awareness of the technology and its advantages. One-fourth more (24%) said deploying it would not have a positive impact on business, which indicates a lack of understanding of its benefits. We found similar uncertainty elsewhere. Fewer organizations are confident in their ability to select and use sales forecasting technology (35%) than are only somewhat confident (40%); at the extremes, slightly more are not confident (14%) than are very confident (12%). Organizations that reward forecast accuracy also are more often satisfied with their sales forecasting technology (79% vs. 44%), which indicates maturity in understanding the full potential of technology investments. 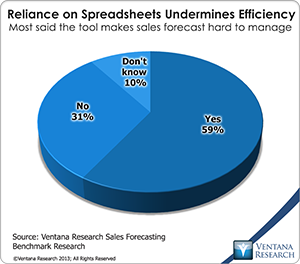 Yet many organizations use spreadsheets for sales forecasting even though more than half (59%) admitted that reliance on them undermines efficiency and only 24 percent said they are accurate and timely. This research also finds much indecision about making changes to improve the process or the technology for sales forecasting. A larger percentage of sales organizations said they are not planning to change their process (41%) than said they will change it (32%); more than one-quarter (27%) do not know whether they will change the process. The most common drivers for changing the forecasting process are a business improvement initiative (for 65%) and a drive to improve the quality of business processes (60%), followed by increased operational efficiency and cost savings (48%) and improved sales and revenue generation (47%). All of these are good reasons, but we think that commitment to sales excellence and maximizing the number and value of sales should be enough to justify investments and efforts at continuous improvement. Dedicated applications can contribute to more accurate sales forecasts, but we find that many organizations aren’t prepared to implement them or do not understand why they should. For organizations that are planning to change vendors for technology, the most common reason is to speed up the forecasting process (54%); fully half of this group is not satisfied with the current product’s functionality. The current research found organizations are dissatisfied with their tools because data gets outdated quickly, which indicates lack of integration of data and tardy processing of forecasts. We conclude that many organizations should make a deeper commitment to sales forecasting; the research shows that those that do invest and improve are reaping the rewards in increased sales. 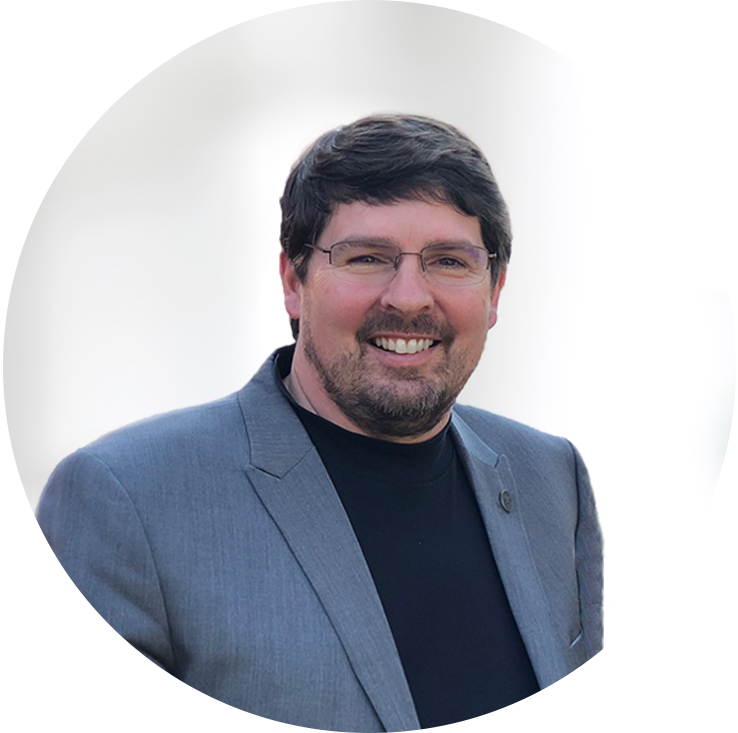 We add that improving accuracy and participation should be rewarded and that up-to-date sales pipeline information should be processed into a periodic sales forecast that should be readily available. The whole point of a sales forecast is to measure performance of sales activities, and that should be aligned to the quotas assigned to the sales force across territories. Also important is the capability to examine the forecast by customer, product and geography to determine where more management is required and where coaching and instrumental changes to the sales methods used to drive the best execution through improvement to the efficiency and results. The sales forecast also impacts other key process, such as the financial plan, the demand plan for operations including customer service and field service, and manufacturing and distribution. It is critical for streamlining the overall business plan. Sales forecasting should be a well-managed, collaborative process with capable technology to support it, and not just running a report from the SFA that summarizes the current state of activities and lacks the analytics and collaboration required to operate the process. Having a commitment to improve the process and information requires technology that is designed to support it and finding ways for gaining more participation and interaction through collaboration and mobile technology. I urge every organization that has issues in its sales forecast to conduct a self-examination with an eye on how to improve it.